Ability to monitor domain deletion poll messages and then either remove the domain from WHMCS or mark it as cancelled. Automatically send an email notification to the customer when their domain has been deleted. Ability to cancel an incoming pending domain transfer request from the admin area of a domain. Added activity logging under the clients “Log Tab” for domain transfers In & Out and domain deletions, domain redemptions, Invoice adjustments, domain suspensions and domain expiry. Ability to automatically add a specified redemption fee to a co.za org.za net.za and web.za domain renewal invoice when a domain enters redemption. Send an email notification to the customer when their domain enters the redemption period. Automatically cancel an outstanding domain renewal invoice when a domain is deleted at the registry. Ability to cancel a domain contact update from the admin area of a domain. View the last 10 Poll messages for the domain in the admin area of a domain. Display the domain’s EPP status in the admin area of a domain. Display the domain’s contact status in the admin area of a domain. Automatically send an email notification to the customer when their domain has expired. Automatically send an email notification to the customer when their domain has been suspended due to expiry. Added the ability to suppress email notifications if the domain is in a "Cancelled" status. Fixed some minor bugs when using the module on WHMCS version 6. The pending_transfers.php cron has been deprecated and has been included in the newly written domains_sync.php script. 1. Download the domainsDotCOZA WHMCS module provided in the link above. 4. Rename "/modules/registrars/domainsDotCOZA/tools/config_defaults.php" to config.php. 5. Navigate in the WHMCS Admin Area to "Setup => Products/Services => Domain Registrars"
6. Click on the "Configure" for the DomainsDotCOZA Module and you will be presented with the following screen. key : This your domains reseller API key which enables the module to work. Premium DNS Service : This if you do not have your own nameservers you can utlize our redundant nameservers absolutely free. Monitor Transfers In : Allow our module to monitor incoming domain transfers in order to process the domains in WHMCS. Monitor Transfers Out : Allow our module to monitor outgoing domain transfers in order to process the domains in WHMCS. Process Transfers Out : This option instructs our module on what it should do with a domain when a domain is transferred out of WHMCS. The options here are to delete the domain from WHMCS or to mark the domain as cancelled. Monitor Domain Deletions : Allow our module to monitor when a domain is deleted at the registry. Process Domain Deletions : This options instructs our module on what it should do when a domain is deleted at the registry. The options here are to delete the domain from WHMCS or to mark the domain as cancelled. Cancel Renew Invoices : Allow our module to cancel a domain renewal invoice when a domain is deleted from the registry. Monitor Domain Redemptions : Allow our module to monitor when a domain goes into redemption. .ZA Redemption Fee : This is the fee you would like added to a domain renewal invoice once a domain goes into redemption. This fee is in addition to the normal renewal fee you charge your customers. Domain Redemption Template : The name of the domain redemption email template which will be used when sending an email notification to the customer. Notify Domain Expiry : Allow our module to notify the customer when their domain is suspended or expires. Domain Expired Template : The name of the domain expired email template which will be used when sending an email notification to the customer. Domain Expired Suspended Template : The name of the domain expired email template which will be used when sending an email notification to the customer. Notify Successful Transfers In : Allow our module to notify the customer when their domain successfully transfers in. Transfer In Template : The name of the successful domain transfer in email template which will be used when sending an email notification to the customer. Notify Successful Transfer Out : Allow our module to notify the customer when their domain successfully transfers out. Transfer Out Template : The name of the successful domain transfer out email template which will be used when sending an email notification to the customer. Notify Failed Transfer In : Allow our module to notify the customer when their incoming domain transfer fails. Failed Transfer Template : The name of the failed domain transfer email template which will be used when sending an email notification to the customer. Notify Not Eligible Transfers : Allow our module to notify the customer when their domain transfer fails due to not being eligible for transfer. Not Eligible Template : The name of the not eligible domain transfer email template which will be used when sending an email notification to the customer. Notify on Domain Deleteion : Allow our module to notify the customer when their domain is deleted at the registry. Domain Deletion Template : The name of the domain deletion email template which will be used when sending an email notification to the customer. 7. 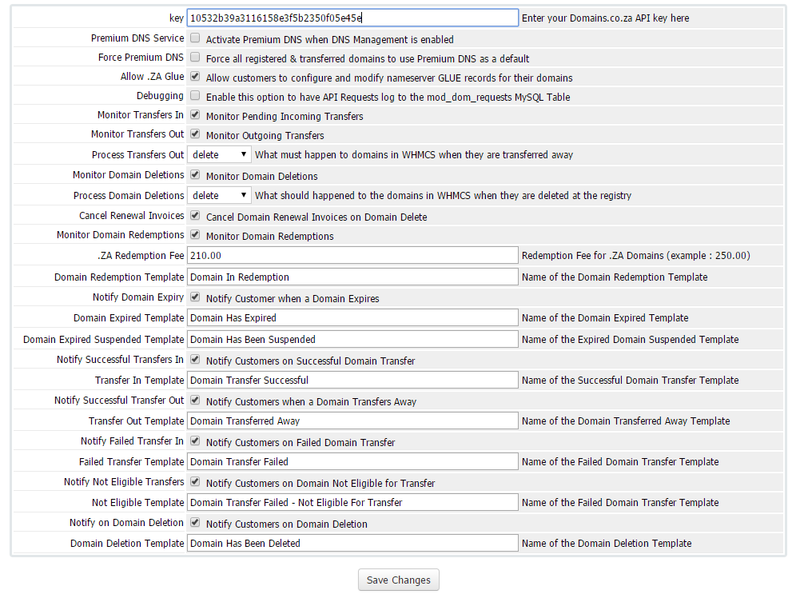 Enter your Domains Reseller API key into the "key" text box. Select / Deselect the configuration options you would like and click the "Save" button. - Replace the your-website-address.com with your actual website address. - Delete the /modules/registrars/domainsDotCOZA/install.php script after you have run this. templates in "Setup => Email Templates"
9. Update your domainDotCOZA scheduled crons. above without editing it first with the right location. into the "--poll" call above. 10. Navigate to "Setup => Products/Services => Domain Pricing"
- Setup the "TLD" to use the DomainsDotCOZA Registrar module. of custom DNS management which requires this option. Once tasks 1 to 10 have been completed, the module has been installed successfully.